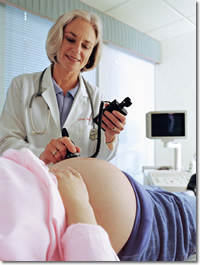 One of the key elements in the outcome of a pregnancy is prenatal care. Prenatal means before birth, but optimal pregnancy care is not only prenatal, but in fact pre-pregnancy. A mother’s behavior during pregnancy, as well as her general health even before pregnancy, influences her child’s health. Pregnancy may seem far removed from life right now, but things can change fast; a healthy lifestyle doesn’t happen overnight. Pregnant women of all ages should consider the following. 1 Cunningham et al., 1997. 227. 2 Cunningham et al., 1997. 230. 3 Cunningham et al., 1997. 26. 4 DeCherney and Pernoll, 1994. 192-193. 5 Cunningham et al., 1997. 229. 6 Cunningham et al., 1997. 231. 7 Kolasa and Weismiller, 1997. 205. 8 Cunningham et al., 1997. 230. 9 DeCherney and Pernoll, 1994. 191.